Home Columns Madame, Monsieur — Dinner is Poured! Madame, Monsieur — Dinner is Poured! One of the most relaxing and enjoyable things to hear at supper time is the popping of the cork (or the turning of the screwcap? ), the splashing of wine into the decanter or wine glass, and perhaps, the sweet prayer of thanking the Lord for the blessings of the vine. For so many of us, enjoying a nice glass or bottle of wine at dinner is seen as one of life’s great pleasures. And every meal—no matter what the spread: haut-cuisine, fast food, comfort, or El Bulli lab food, any accompaniment of wine further bumps up the gustatory pleasure. Bordeaux & Steak. For any of you who lived or worked around the Newport Beach or Orange County area in the 70’s, 80’s, & 90’s, you’ll remember The Arches Restaurant off of Pacific Coast Highway and Newport Boulevard, where the boulevard drives out onto the Balboa Peninsula. That restaurant served a killer Steak au Poivre—the classic pepper steak. They did it old style with a final flambé at the dinner table—I think it was a cognac they lit it up with. That definitive cracked pepper, brandy/cognac, butter, beef broth, and Dijon mustard collaboration with a rare to medium-rare New York cut or a medium-rare filet mignon cut was the bomb. Paris, New York, or California –it was the same savor! I remember one late afternoon while my son Paolo and I were driving around—he was nine years old then, and we stopped over to The Arches to enjoy the steak. I figured my son was now old enough to taste what a great food and wine pairing was all about. I ordered a bottle of Château Lynch-Bages to go with the meal. As to a menu priced wine, it was one of those excellent Bordeaux that didn’t cost an arm and a leg. For the record, it was Pauley’s first Bordeaux—he would later amass a huge Bordeaux collection that I still dig into. And not to worry, the kid tried a cute little glass, and, thought about the taste, and went on to order a Coke. Anyway, Lynch–Bages has always impressed me as one of the ultimate steak wines. 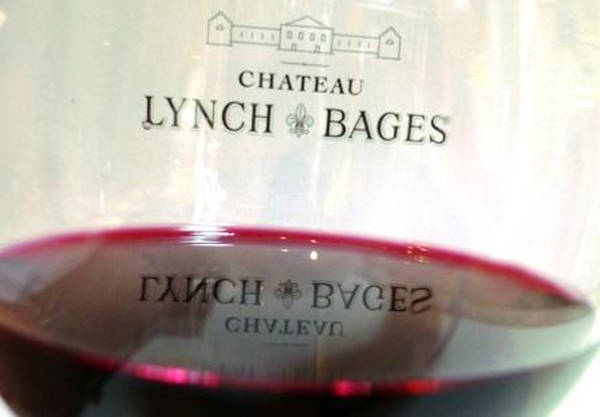 It’s always very elegant, polished, balanced and full-bodied with cassis, cigar box, red and black fruits, blackberry, spice, with a touch of smoke, truffles, stone aromas, and that crazy seam of graphite—that’s the Lynch Bages style through the years. If you let it sit for a while, layers of complexities come into play. In very great vintages, the wine is a powerhouse. It comes from the Pauillac region of Bordeaux, the same that produce the world famous wines such as Lafite Rothchild, Latour, Mouton-Rothchild, and Pichon Lalande. However, I remember ordering a 1983 Lynch-Bages with lunch at a Chamber of Commerce function. As I looked around, everyone else was ordering tea and sodas to the consternation of the waiters. I was happy to oblige the staff who provided great fanfare opening the wine at the group table. Some of the chamber members looked at me with expressions that questioned, “Don’t you work?” Others with nice smiles shared my wine. But for that year, the wine was on the lighter side with pronounced pomegranate flavors. It was perfect for lunch and brightened things up! Côtes du Rhône & Roasted Chicken. Wonderful and tasty foodie-style roast chicken is on the menu again in so many households and is one of the most fun dishes to enjoy with wine—it pairs with almost anything. The chicken really lets the wine shine. As we’ve recently highlighted with the E.Guigal article, a Côtes du Rhône (Hills of the Rhône) is from the South of France where the Grenache grape is dominant and so flavorful with its characteristic notes of black pepper, cherries, earth, herbs, raspberries, plums, and spices. That’s a made in heaven marriage with roast chicken—yeah? And remember, the French have been pairing this meal for centuries. For who does chicken better than the French? No one! I mean even before the Franks took over and named their country, for eras beforehand, the terrestrial was called “Land of the Chickens”. Romans called it “Gallo” (Chicken-land); the ancient world called it “Gaul”. Beaujolais/Dry Lambrusco & Bistro Fare. Originally and generally, one enjoyed “bistro fare” at all the famed and hole-in-the-wall bistros in and around the City of Lights, Paris. It was wildly well prepared meals of offal, head-cheeses, pork skins, tripe, frog legs and escargots (snails) and the like that were cooked with garlic and great wine sauces. The rich weren’t eating this stuff, but the bourgeoisie were taking it down because it was just great comfort food. And the wine of choice that was even as cheap as the grub was Beaujolais from the Burgundy region that was less expensive than the Bourgogne and the Bordeaux. Now the world cooks “bistro” but the wine remains the same. Anyone who has tried the “Beaujolais-Villages” (we’re not talking ‘bout Beaujolais-Nouveau—the party wine) from any of the Beaujolais regions comes away with the realization that a light to medium body red with “rustic” comfort food, along with charcuterie and salumi (cooked coldcuts from pork) is intoxicatingly delicious. Along similar lines, is dry Lambrusco. Again, we’re not talking about the youthful party wine sweet sparkling Lambrusco. Authentic dry Lambrusco provides the same epiphany as a good “Cru/Villages Beaujolais”. Both wines are dry but fruity with notes of black cherries, flowers, grapes, plums and a touch of earth. Dinner’s served! Bon Appétit & Cheers!